The Return To The East Live (2016) bonus footage documents Dokken, Lynch and Pilson, hammering out what they would consider their quintessential set. It’s great to get an inside look at them in a room being cordial and enjoying one another’s company (though in true Dokken fashion, it didn’t last). The bonus footage also captures some fantastic behind the scenes rehearsal footage of Lynch, Pilson and Brown (a couple clips with Don). There’s some haphazardly edited interview footage with Lynch, Pilson, ‘Wild Mick’ and Don that you can take or leave and footage of the band meeting Japanese fans. Looks like the ‘fist pump’ just landed in Japan? The biggest issue with Return To The East Live (2016) isn’t the fact that Don Dokken isn’t capable of being the Don Dokken of 1988. The problem lies in the footage, the dated camera effects used on some of the material and the poor choice to fade out each performance. The title is Return To The East Live (2016) so would it be unreasonable to expect a complete Japanese concert from the 2016 tour? What would you expect? What you get is about 60% footage from the ‘warm-up’ show at the now defunct Badlands Pawn, Gold and Jewelry venue in Sioux Falls, South Dakota. Now, how’s that returning to the east? That’s not even the Eastern United States! Musically, Dokken sound fantastic on Return To The East Live (2016), specifically the rhythm section of Mick Brown and Jeff Pilson. George Lynch at times strays from the original arrangement and really should have stayed true to the classic solos. You have all the usual suspects that you’d hope make the set like “The Hunter,” “Unchain The Night,” “Tooth And Nail,” “Into The Fire,” “Alone Again,” and “In My Dreams” amongst others. All in all, a relatively ‘safe’ Dokken set. Noticeably absent is “Mr. Scary.” Return To The East Live (2016) is for the diehards and it’s available as a deluxe CD/DVD which includes a newly recorded track for the package titled “It’s Another Day.” It’s rather good. They also added acoustic renditions of “Heaven Sent” and “Will The Sun Rise.” If they had done something like this on One Live Night, it would been better received outside of Asia. One of the most hyped but short lived reunions in recent years has been the return of Dokken‘s classic line-up of lead vocalist Don Dokken, guitarist George Lynch, bassist Jeff Pilson and drummer “Wild” Mick Brown who reunited in the fall of 2016 for a series of lucrative concerts in Japan as well as one warm-up gig in the States beforehand. Being that Dokken have been one of my favorite bands from the ’80s and one of the only bands for which I buy any new material no questions asked, I was really excited at the reunion of the line-up that came up with such classic records as Tooth And Nail, Under Lock And Key and Back For The Attack. There’s something that is simply special about having these four guys together on the same stage. Much has been said about the frosty relationship between lead vocalist Don Dokken and axe slinger George Lynch but it certainly appears that the duo can get along at least for a couple of weeks without killing each other — and the right amount of money! Musically, Dokken sound very tight on Return To The East Live (2016) with Pilson, Lynch and Brown sounding really good together. Of course, the three of them have played together in other projects aside from Dokken over the years including T&N and now Super Stroke, which has Warrant frontman Robert Mason handling the lead vocals. So it cannot be said that it’s been 20 years since the three of them have played together. The setlist on Return To The East Live (2016) is predictably some of the best known Dokken songs and while it might have been fun to have the band dig deep and play s0me deeper cuts, that just wasn’t going to be happening with the limited amount of songs that appear on the record and the vast amount of great tracks that the classic line-up came up with over the years. 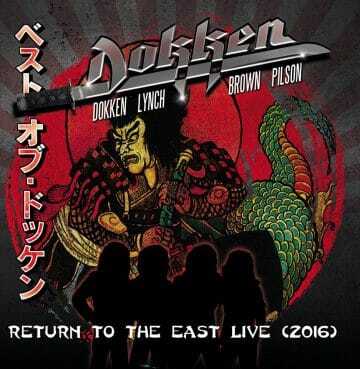 Return To The East Live (2016) breaks my streak of purchasing any new Dokken album no questions asked as there were just too many question marks in my mind about Don Dokken‘s vocals. Having seen Dokken play live at the M3 Rock Festival back in 2015, I saw first hand what people were talking about. Unfortunately, Don Dokken‘s vocals are nowhere near what they were 30 years ago. Nevertheless, Don Dokken‘s singing was good enough at the M3 Rock Festival and for most of the tracks on Return To the East Live (2016), his vocals are good enough again. There are however a couple of tracks where it’s almost painful to hear him sing such as “Kiss Of Death” where he doesn’t get much support in terms of background vocals. Overall, while Don Dokken‘s singing on the classic Dokken songs is quite different than on let’s say Beast From The East, it’s still fun to hear him sing with Lynch, Pilson and Brown backing him up. Overall, Return To The East Live (2016) is a fun release for the diehard Dokken fans but a weak introduction to the band due to the subpar quality of Don Dokken‘s vocals if someone was just discovering Dokken for the first time with this release.